It's a lovely day here, so I decided to do a hive inspection. Well, actually I just took off the lid and peered in. I wanted not to disrupt too much by removing frames yet. We suspected that the swarm we captured in Marysville was extra specially large, and were curious to see what they've been up to. I remember the swarm box feeling heavy when I carried it to the car. (Also warm, and vibrating). Had they found enough forage to draw out 2 boxes of fresh comb yet? (Did you know beeswax is secreted scale by scale from worker bee abdomens, and that in order to properly sculpt it, the temperature inside the hive must be quite toasty?) Were the girls needing space to expand? Might they even be desirous of extra space for surplus honey? We found quite a lot to notice about the hive just from observing its outside. The bees look quite busy from my bucket observation seat-- always there are a dozen or so both landing and taking off. And there is a delightful sweet baking scent wafting downwind. I've been able to see pollen in the foragers' pollen baskets, which makes me think they are feeding brood (nice laying, queen bee!) They make a generally happy industrious buzz as they fly into the crack they use as an entrance. And as Joey said, they are all over the flowers in the garden, so I think they are learning their way around this new place. They are tidy. I've seen a worker carry out both pieces of dried grass and dead bees, and fly over the street to drop it. We've also watched a living bee rebuffed at the landing board. It was behaving strangely-- moving jerkily, and rearing up to touch antennae with each bee it met. Was it sick? Or defensive because it was plotting theft? Some bees steal from other hives. Did you know? It did eventually get in, but it took 10 minutes or so. Anyway, it looks like all but one frame are drawn fully out with comb. Both boxes. I'm delighted. And I gave them an empty box to move up into. And it just took 5 minutes. No one stung me or got squished. It was all very civilized and mannerly. Tomorrow my mother will install her first bees into a lovely copper-top hive she purchased and painted. They were raised by the Green Gulch beekeeper. I'm excited to see how that goes. Please take some pictures, Mama. 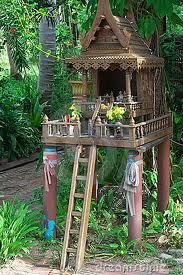 And finally, behold my new beehive--The Thai Spirit Bee House. Hand crafted by my dad, Tom Walker, for my birthday. It is the loveliest thing I've ever been gifted. My mother painted it. My parents are both true artists, and their love is in the details. A carved honeybee portrait, arched windows on the side, and this gorgeous copper roof. In Thailand this Fall, I became enamored of the Spirit houses most businesses and homes kept. Daily offerings were made to the spirits of the place, some rice, a garland of flowers, incense... In one restaurant, bees had moved in, and were visible through the windows, quivering delicately on their comb, and going peacefully about their business. I couldn't figure out a way to get one home. But this is even better. I look forward to enjoying it the rest of my life. Thank you Mama and Papa. I love love love it, and you, so much.